Handmade rhodonite jewelry is available from Glassando! 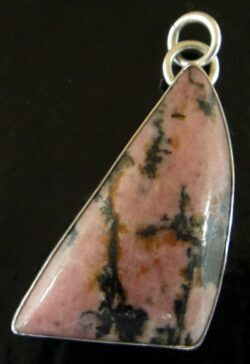 This includes rhodonite pendants as well as rhodonite set in sterling silver. This fascinating natural gemstone features shades of brown, black, and pink, making it a great choice for lovers of pink jewelry, neutral colored jewelry, or unique natural gemstone jewelry. Much of our selection of rhodonite jewelry is handmade in the USA by Dale Repp, a jewelry designer who is local to the state of Iowa. Artisan rhodonite jewelry from Glassando is a wonderful option for those who enjoy pink jewelry, neutral colored jewelry, multicolored gemstones, or opaque gemstones. Our selection of rhodonite and sterling silver jewelry is largely handmade in America. You can view lots more handmade pendants, necklaces, bracelets, earrings, and rings inside our retail store in downtown Iowa City. Glassando is a locally owned boutique jewelry store located inside the Old Capitol Town Center, which is often also called the Old Capitol Mall or the University Capitol Center. It can be found next to the University of Iowa Pentacrest. Convenient parking is available inside the Capitol Street Parking Ramp, which is attached and offers your first hour free of charge. Stop by or shop on our website to see lots more artisan jewelry!